The publication in America of Maraini's The Silent Duchess, originally issued in Italy as La hunga vita di Marianna Ucria (1990), is cause for rejoicing. Episodic and essentially plotless, but propelled by an inner tension, this unusual historical novel about the splendid but squalid Sicilian aristocracy of the early 18th century comes closer to belles lettres than a conventional novel. As a result of being sexually abused as a young child, the duchess Marianna (in real life, an ancestor of the author) has lost both voice and hearing and communicates with others by writing notes. A free spirit, she contrives to educate and liberate herself through reading while living in a society that totally subjugates women. (Sicilian aristocrats were so idle and poor, though wealthy in unproductive land, that all members of the family were sacrificed to the eldest son and heir.) The only choices for women of her rank are either an arranged marriage (Marianna's father marries her at 13 to her uncle, who is also her abuser) or betrothal to Christ and life in a convent (the choice of Marianna's daughter, Felice). As Camaiti-Hostert writes in her afterword, this novel is ""the story of a life seen, smelled, tasted, and touched""; like a silent movie, the narrative unfolds without sound, but in Maraini's deft hands, this silence becomes a powerful metaphor for the plight of a young woman growing up in an impoverished but proud, unenlightened but self-righteous patriarchy. 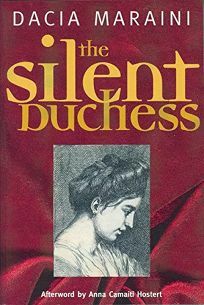 (Nov.) FYI : The Silent Duchess won Italy's 1990 Premio Campiello and England's 1992 Independent Foreign Fiction Award. It has been translated into 14 languages.